Constitutional lawyer Dr Shaista Shameem’s initial comments on the draft Fiji Constitution 2013 released to the public by the Prime Minister Commodore Baninimara on 21 March 2013. The draft 2013 Fiji Constitution released yesterday (March 21) by the Prime Minister is, undoubtedly, marginally an improvement on the Yash Ghai draft constitution. The Yash Ghai constitution had proposed an election of the Head of State by an undemocratic body, the National People’s Assembly – a body which would have become more significant than even the elected parliament in Fiji. However, to its credit, the government’s draft constitution 2013 retains the solid Bill of Rights chapter from the 1997 Constitution and adds other protections now reflected in international law such as children’s rights, rights of people with disabilities, and economic and social rights which are all justiciable (this means an application can be made directly to the High Court or to the Human Rights and Anti-discrimination Commission for redress in case of any breach). I also approve of the election of the President by a Parliamentary College as being consistent with my views and submissions made to the Yash Ghai commission that the President of Fiji should be elected. But there are also some significant changes in this new draft, which, due to the demise of the plan to put before a Constituent Assembly as promised, will not now properly be aired in public discussion and debate which is itself part of the process of ‘we the people adopting this constitution as our own’. (i) The President’s power has been whittled down to next to nothing. The current President has effectively been given his letter of termination since section 84 of the draft states not only that a President will have, at the most, a 6-year term, but that any period of occupying that office prior to the commencement of the new Constitution will be taken into consideration in the next appointment. (ii) The President has no power now over the military; the Prime Minister will be Commander-in-Chief of the RFMF. This is inconsistent with section 130 of the Constitution which gives the military the righ to look after all the people of Fiji. This has implications for security and safety of the people (for example) if an event like that of 2000, when the Prime Minister and his government were held hostage by Speight, take place again. The Commander of the RFMF in the government’s draft constitution has no power other than to appoint and remove persons from the RFMF, and for discipline. So what does section 130 (2) actually mean? That section is a dead letter. (iii) The President cannot refuse his or her assent to any bill; if a bill is presented to the President by parliament, he or she must assent to it within 7 days. Otherwise the bill becomes law anyway. (iv) The chapter on the Judiciary has a number of clauses that do not fit correctly in that chapter- for example the Fiji Independent Commission Against Corruption appears in that chapter, through it is an investigative body and not a judicial one. Clearly the drafters do not understand the principle of separation of powers which is the heart of constitutional law. (v) There are no independent commissions in the draft constitution. The Human Rights and Anti-discrimination Commission is one of the few commissions specifically mentioned but how the appointment of persons to the Human Rights Commission or other commissions will be made is a big gap in the draft constitution- where are the checks and balances in the appointment of persons to public office? (vi) As for the chapter on Parliament; the question is, if there are no political parties registered so far, is parliament going to be just a group of independents? The Prime Minister should come clean on how many political parties were properly registered at the deadline. The draft constitution of the government was clearly done in a rush. 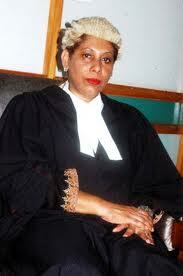 Dr Shaista Shameem is a constitutional and human rights lawyer. She represented David Burness and others in the human rights case of Burness v the State and the Fiji National Provident Fund in 2011. That is a fantastic read. I love this blog. Thanks for blogging.